While standing recently on the bridge at Fassaugh Avenue in Cabra, which spans the railway tracks and the heavenly hills of my childhood I pondered Thomas Wolfe’s great dictum ‘You can’t go home again’. On the hills that were our mountains back then they have torn away the bushes and uprooted the trees that gave so much un-worried pleasures back in the days when we were never going to grow old. These are the hills, bushes and trees where we ambushed the Japanese and German armies and where we slaughtered General Custer. They are building houses there now more’s the pity. Nonetheless in the stillness of the cool morning air I could almost hear someone banging a can against the ground and a voice singing ‘All in, all in the game is broke up’. Do kids anywhere these days, never mind Cabra still play those winter night games? There was Kick the Can, Relievio, Catch a girl/kiss a girl. Do they still tell frightening ghost stories under the street lamps where we used to? And the Summer Holidays! Who among us then can forget the gloriously sunny days trekking to and from the Phoenix Park via the railway tracks? The bright long days spent on the hills behind our houses digging secret tunnels and roasting potatoes over wispy fires fueled by twigs and branches. Of course the same fires were used to send smoke signals to other warriors on the far side of the railway tracks who might be looking to do battle. And just in case my reminiscences seem too idyllic we weren’t above stoning the passing trains that ran through our territory out of devilment and boredom. I don’t know if we hurt anybody but we certainly scared the life out of them. And then there was the swimming in the Royal Canal that ran above the railway tunnel at the back of the hills. We usually swam naked in a straight section of the canal that was known as ‘the bend’, so named because it was directly above the bend of the tunnel. As I write this I can still see ‘Baldy Prew’ taking a flying leap and jack-knifing through the air before breaking the water. None of us could match him for diving. Nobody swims there now I’m told. Then there was the ‘Lair’ or the playground. There were two playgrounds actually, one for the boys and one for the girls. The playgrounds were a veritable paradise. The boy’s playground contained two football pitches, three handball alleys, tennis courts, a hard cricket pitch, sand pit, swings, monkey puzzle, see-saw and a Club House for indoor pursuits when it was raining. The girls also had a Club House and they too had swings, roundabouts, tennis courts, marked out areas for skipping and other games. Then there were garden plots for growing vegetables, cultivated by both girls and boys. As we grew into our teens and twenties the playground was always there particularly at night and on Sunday morning when it was officially closed. Football and Handball burned up the energies during the week and on Sunday mornings we even played seven-a-side soccer matches for a dollar (five shillings) a head and then afterwards into ‘Matts’ for the first pint of the day. That doesn’t happen anymore, both playgrounds are gone. The G.A.A. Club with a bar and training facilities for those engaged in G.A.A. sporting pursuits has replaced them. Soccer and handball are no longer played there nor is tennis and certainly not cricket. Some say this is a good thing as the playgrounds had fallen into disrepair but I don’t know. There seems to be nowhere now for the unstructured sporting pursuits like hanging out with a football or with a Hurley stick and ball the way I used to in the handball alleys. What do the young men of the area do for amusement if they don’t want to join the G.A.A.? 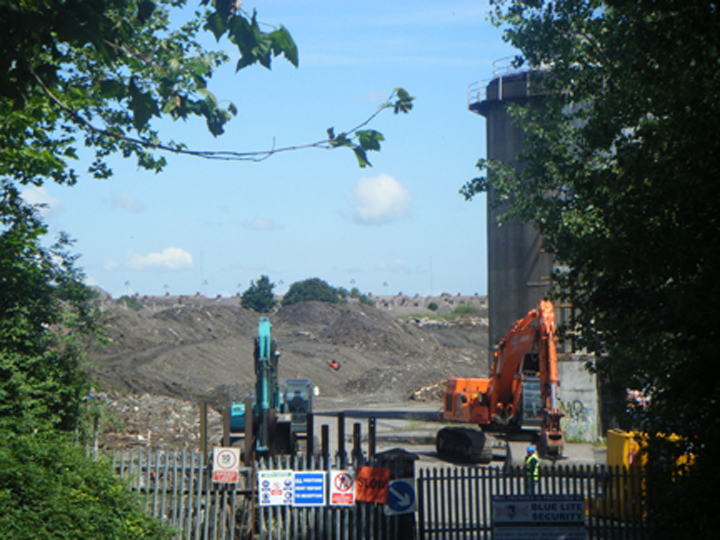 Those dreamy hills are all fenced off now and the earth movers have moved in and maybe that’s a good thing too but where do kids go for adventure now around that part of Cabra? Is this progress? Perhaps, but Cabra seems old to me now. The promise of something here seems to have gone. Maybe this is just the imaginings and ramblings of people like me who are as old now as Cabra is. But Thomas Wolfe is right, you can’t go home again and you shouldn’t even try. Memories in the head dissolve into the heart and that’s when the idle tears…but stays! Who’s that I see coming through the gap? Why it’s General Custer…right into our trap!